While far from being Danny Schmidt’s first album; it’s the first I’ve heard; yet I’ve seen him play live three times – each time as support and alongside his wife Carrie Elkin; whom I’m a big fan of. 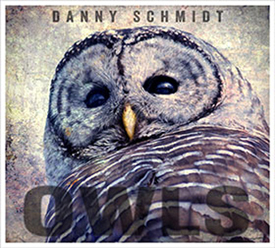 Owls opens with a delightful vaguely Tex-Mex song called The Girl With the Lantern Eyes and Schmidt’s breathy voice just radiates throughout, and at times is the type of song that makes you tip your head towards the speakers so as not to miss anything. Straddling the Folk hurdle often occupied by the likes of Tom Russell, Guy Clark and Justin Townes Earle, this set of wordy, even poetic songs are all awash with tiny details that set the scene and mustn’t be missed or you will be left confused. I’ve only ever seen him play solo; so the assembled ensemble of top quality musician and luscious production by David Goodrich were a tad confusing at first; but I soon sat back and let the exquisite arrangements wash over me; with Faith Will Always Rise and All The More to Wonder sounding like they come from the same stable as James Taylor and Paul Simon, but not sounding like either. This is meant as a compliment but Bad Year for Cane and Paper Cranes sound like they are destined for the soundtrack of some film or TV programme set in Delta; and if they are it will be as the cameras swoop over the mangroves and swamps as the sun is either setting or rising and you will be left quite breathless. As is often the case the best is kept for last with Wings of No Restraint being of epic proportions, full of soaring vocals, chunky guitar licks, knife sharp steel guitar, punchy and shimmering cymbals. Owls is a worthy addition to my music collection and is guaranteed to come out on those hot, balmy nights of late Summer as I sit with a long cool drink in my hand.